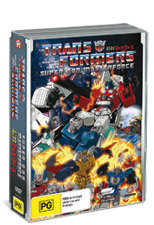 This classic 1988 cartoon series has arrived on DVD thanks to Madman and takes place after the Decepticons were banished from Earth by the Autobots. In order to protect the Earth from the Decepticons, a team of Autobots have remained on Earth who have managed to transform themselves into "humans" and are known as the Pretenders. Their cautionary approach has once again reignited the war as the Decepticons have returned to Earth, seeking the most powerful super robot of history... the Godmasters! Unlike the traditional "Western" Transformers, both sides of the war have turned to humans for assistance and have given them transforming battle suits to hopefully change the tides of war for one side or another. It's a classic tale, told by a Japanese perspective which is more entertaining than the original Western series, however a little hard to follow in some places but all in all, it's an entertaining series of over 1050 minutes of Transformers entertainment! The video and audio quality is a little dated but considering it was made for television, it is quite acceptable. There's also some great entertaining special features and brings back good memories from anyone's childhood of around this time. Definitely one for children and adults alike!